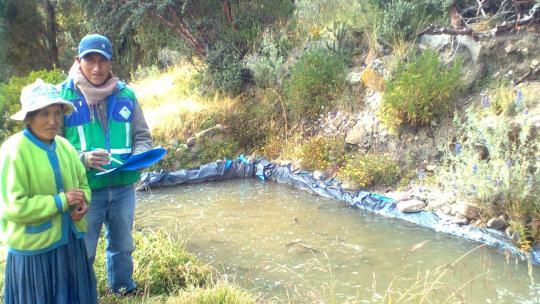 Rody is a hard-working loan officer at one of Fondesurco’s branches, located in Chivay (Caylloma), Peru. He is 22 years old and is originally from Coporaque, which is 7 km away from Chivay. He is been working in Fondesurco for two years and one month. Prior to this, he studied Technical Farming business administration. When he started at Fondesurco, the agency chief gave him a quick introduction course in the afternoon, and he was assigned to a work zone in the province. Nowadays, he is aware that the new training officers receive more training than he had. His favourite part of the job is evaluating loan applications and hearing his clients’ experiences and stories. He wants to continue working in microfinance, because it gives loans to those people who were previously excluded from the financial system, which can help them to grow their businesses or activities. A normal work day for Rody starts very early in the morning. He wakes up at 4:30am and gets ready to go out into the countryside. He prepares his motorcycle and heads out to visit his clients in Yanque town around 5:00 am. He then rides to the towns Achoma and Maca to collect money from clients who have repayments due, or visit those who have pending credit evaluations. He always makes sure to remind the clients of their repayment schedule. Each credit evaluation takes around 20 minutes, and checking the client’s business can take 30 to 45 minutes per client. 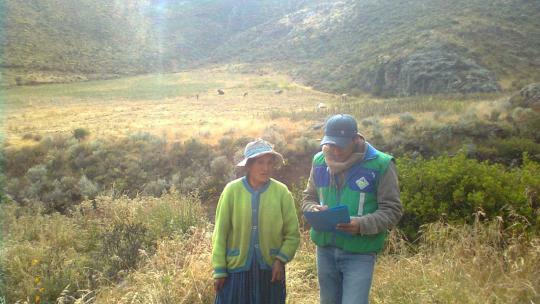 Rody visits his clients early because they work in farming and livestock, so they start work very early. He has usually finished by 10:00am, at which point he sometimes goes back home for his breakfast, or sometimes eats it in the countryside. He arrives home at around 10:45am, takes a quick shower, and goes to the office at 11:00am. He enters the morning’s data into the Fondesurco credit system, and he advises other clients until 1:00pm. He eats lunch in a local restaurant because he does not have anyone to prepare his food. Sometimes, during his lunch break, he spends time telling people about Fondesurco loans to drum up more business. In the afternoon, he continues entering data into the system because during the morning it is hard since there are clients to help. When there are unusually large loans, he has to stay in the office until 7:30pm to get the appropriate sign-offs. For each loan, potential clients must bring certain documents, such as, ID, utilities bills, documents to confirm their business (watering bills, livestock records, and working licenses), and a guarantee. Following a loan closely after it is disbursed is very importan to be sure that the client’s loan use and business are progressing well, as well as to alert Fondesurco of any potential repayment problems. Rody must also teach clients about credit products and the risks involved with using them. If the client experiences difficulties in repaying, first Rody must assess whether they are telling the truth or not. If they are, they are offered a second chance to repay, by refinancing their loan. Whether the client is new, or a loyal long-term client, he has always to check the central risk system, and to get neighbours’ references as part of his loan application evaluation. This is done before the formal evaluation visit, and together with Rody’s experience, are important for helping him to assess the client. Rody’s goals are to achieve his work objectives at Fondesurco, and as a professional to keep improving himself through training and studies.